Container shipping companies are bracing for a challenging year — they will have more space available for carrying goods than the amount of cargo that’s out there. Corrine Png, chief executive officer of research firm Crucial Perspective, estimates freight-carrying capacity on container ships will rise 5.9 percent this year, outstripping demand growth for the first time since 2015. That’s largely because more than 40 huge container vessels ordered at least two years ago are ready to be delivered for service, creating an abundance of ship stowage. With some of the space expected to be left empty, container lines could be forced to charge lower fees for shipping goods, even as they try to overcome years of accumulated losses in an industry downturn that has seen at least one company collapse. More than 90 percent of global trade is transported by sea. 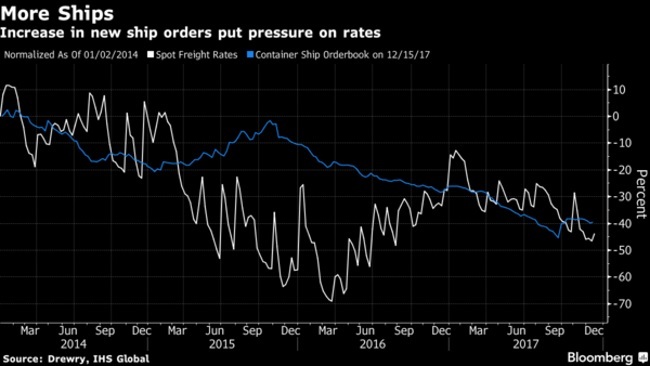 The five charts below show what’s in store for shipping companies. As more large vessels are delivered and put into service in 2018, ships’ cargo-carrying capacity is expected to expand the most in three years. Some container lines could take advantage of currently low shipbuilding prices to order more vessels, Png says. As history has shown, sea-freight fees tend to be squeezed when the ship orderbook expands, due to concern there will be an excess of space. Companies need to raise a combined $144 billion to take delivery of all vessels this year. Of that amount, 73 percent will come from buyers in Asia and Europe. Container ships are estimated to account for 98 of this year’s orders across vessel types and 120 for next year. Overall, the number of ships on order is expected to rise 54 percent to 662 this year and to 820 in 2019, said Park Moo-hyun, an analyst at Hana Financial Investment Co. in Seoul. Crude tankers and dry bulk carriers make up more than 60 percent of total deliveries scheduled for this year, and container ships account for 19 percent. Hana Financial’s Park sees a “steady increase” in demand for large container vessels that can each carry more than 15,000 boxes.